When a user performs a task on a screen, it goes without saying he will use his brain and his eyes to analyze the content of the pages. The brain of users, such as yours or mine, consists of 3 layers: the reptilian brain, the emotional brain and the logical brain. The emotional brain is a filter: it instantly detects and selects information in summary data that is potentially interesting for further analysis. 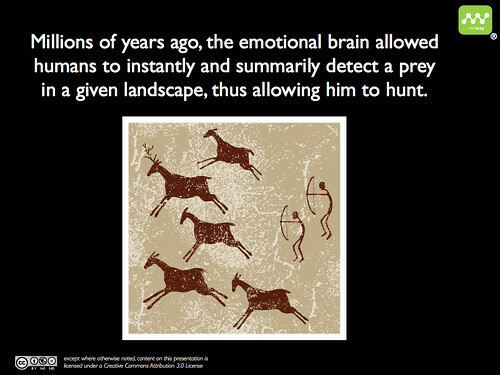 Over time the different functions of the brain have remained the same: millions of years ago, the emotional brain allowed humans to instantly and summarily detect a prey in a given landscape, thus allowing him to hunt. Today, it instantly and summarily detects the potentially interesting zones on a screen that will allow him to place an order, to find information, etc. If information in the visual landscape of the screen is deemed interesting, it will be amplified and as a consequence, our attention will be drawn to it. If the information is not interesting, it will be inhibited. This filtering is adaptive in order to make the work of the logical brain easier. This brain will direct the eyes only to those zones that are ‘good options’, to what is essential to be further analyzed in order to perform a specific task. 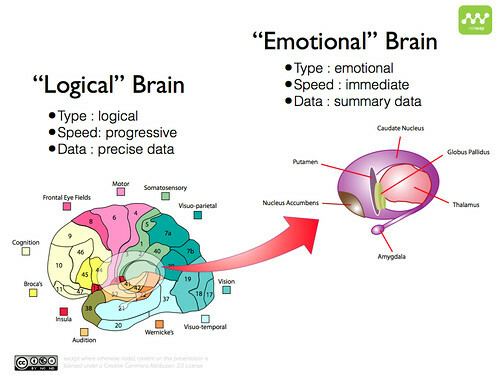 The emotional brain has another fundamental role: it significantly participates in the storage of memories. In order for information to be stored, reinforced and possible consolidated into the long-term memory, it is essential that the interest generated by the information, its emotional load or the generated experience is gratifying. A lot of sites build an impressive wow-experience based on the postula that isolates the emotional and the logical brain. They forget that these two types of brains function in parallel. Indeed, the logical brain and the emotional brain perceive content on a screen at practically the same instant. They can collaborate or dispute the control of thoughts, emotions and the behavior to be had. When users are in front of a site that excites their emotional brain, the emotional brain will send a signal to the logical brain containing the elements it wants to be analyzed. However, if the logical brain decides the content doesn’t respond to the expectations, there will automatically be some kind of competition between the two brains. In the most extreme case, the cognitive brain will inhibit the functioning of the emotional brain in order to focus on a cognitive task and to detach all emotions. We can indeed have a site design that looks more attractive than a previous version but still obtain a lower conversion ratio. All forms of competition between the cognitive brain and the emotional brain will be a bad experience for users. But when the two brains complement each other – the emotional brain gives a meaning to what the user feels and the cognitive brain makes sure the user can progress in the most intelligent manner possible -, users will experience interior harmony. 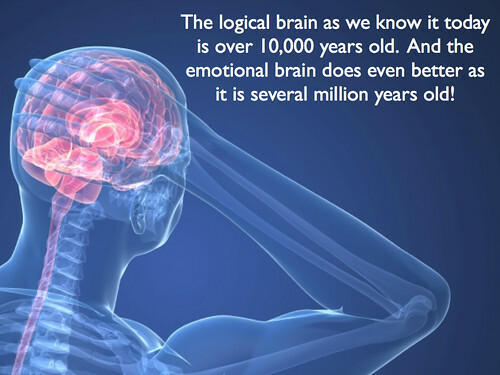 The logical brain as we know it today is over 10,000 years old. And the emotional brain does even better as it is several million years old! So when designing a screen, it is essential to get the emotional brain to show an interest for the important zones and to make sure the emotional brain doesn’t oversell the less interesting zones to the logical brain. Otherwise, you risk that the logical brain takes over and cuts off the information from the emotional brain. As a result, users will go into a rational mode when visiting your site and they won’t have a positive memorization of the experience. Understanding the human brain is only in its starting blocks and there is already an enormous amount of information and scientific publications at hand. – share this knowhow within the universe of digital interfaces. Hey, this is an amazing blog! I’m going to be visiting frequently. I’d love it if you would take a look at our project as I believe it is relevant to your work. We offer affordable custom search engines that put site operators in the driver’s seat. It includes powerful widgets like “top searches”, “related searches”, and “recent searches” on the results page. Also, it works wonders for SEO as the results pages with relevant content and interlinks are picked up by external crawlers. If you’re interested, I can offer you a year of our pro plan for free. Hi Marc, very interesting article here… now I understand better why decisionmaking is moreover an emotional process, even when facts, arguments and rational constructions are there to point on another — mostly long term solution — than the rather emotional — short term solution. Are there any special techniques to strenghten a more rational decisionmaking, instead of being depndent of the very subjective ‘I like’-behaviour? Hi Thomas, I am delighted to see that my modest articles interests you. In UX-design, the emotional state is crucial. Indeed, in order for information to be stored, reinforced and possible consolidated into the long-term memory, it is essential that the interest generated by the information, its emotional load or the generated experience is gratifying. I will treat the “I like, I don’t like” syndrom in an other post. I wish the best for 2012. Hi Chris, many thanks for you interest… I’m always interested in new tools, will be with pleasure that I shall try your tool.